This product requires the base game Carnival Games VR. 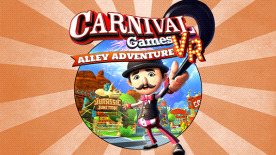 Carnival Games VR: Alley Adventure delivers two all-new adventure-themed alleys, six new games to test your skills at, and enhancements to existing games for increased replayability. Rack up points to earn tickets to exchange for virtual prizes at the Prize Booth. ●Dino Stacker: Stand on the head of a raised dinosaur-themed platform and drop a random selection of blocks to successfully build a tower as high as you can. ●Gravity Match: Use sci-fi gravity guns to rapidly catch objects and fire them back at matching objects to score points. ●Putting Green: Complete a series of miniature golf putting challenges. ● Horseshoes: Toss the horseshoes around the stake and score as many points as possible. ●Trick Shot: Show off your skills in a series of randomized billiard-style trick shots. ●Lucky Cups: Toss as many ping pong balls as you can into a grid of colored cups before time runs out. All 12 existing games from Carnival Games VR have been enhanced and modified for increased replayability. Please note: Requires Carnival Games® VR (base game) to use this DLC. Please note: People's health may be seriously negatively affected by the use of VR, including experiencing symptoms including, but not limited to, nausea, headaches, vomiting, sickness, failure of balance, disorientation, visual irregularities, fainting, light-headedness, seizures, physical injuries related to falls or loss of attention to surroundings, or other discomfort. Players assume all risks of developing such symptoms, and remain responsible for movements while using VR. If experiencing any adverse symptoms during the use of VR, please cease using VR immediately.